Portland in close proximity to a seemingly endless number of trails near the Columbia River Gorge, the Oregon Coast, Mount Hood National Forest, and the surrounding areas. And although I love heading out of town, sometimes it's not feasible to take an entire day off to explore. The good news is that there are plenty of woodlands within Portland city limits as well. I tend to get a little restless when I haven't had the chance to hike in a while. Luckily, the trails at Tryon Creek State Nature Area, Forest Park, and Washington Park are perfect for a quick after-work run or Saturday morning stroll with friends. There are plenty of other spots in the city to explore, such as Mount Tabor Park and Rocky Butte Natural Area, but I would recommending start with the three spots listed below as they offer the widest variety of trails within 5-15 minutes of downtown Portland. Tryon Creek State Nature area is home to a variety of 8-miles of well-kept and quiet hiking trails, in addition to 3-miles of paved bike trails only 15-minutes outside of downtown Portland. This is a great place to spend the day with four-legged friends, dogs and horses* are welcome to explore here as well. *Check the map at the Nature Center for marked horseback riding trails. Spanning over 5,157-acres in the West Hills, Forest Park connects some of the best views and sites in Portland. The Wildwood trail is the most popular routes-- with it's 30.2-miles of trails leading to favorite sites such as the Hoyt Arboretum, Pittock Mansion and Washington Park. This is one of Portlanders' top city spots for premium trail running and due to the range of difficulty in trails. 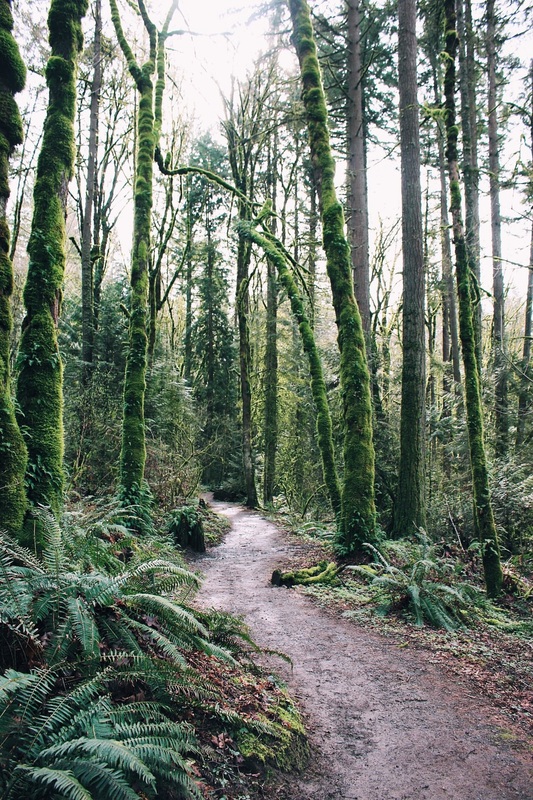 Connected to Forest Park via the Wildwood Trail, Washington Park is a great place for first-time visitors as it features well-known attractions such as the International Rose Test Garden, the Portland Japanese Garden and the Oregon Zoo. Keep in mind that the park can be fairly crowded on the weekends. Read on for a little history and my insider tips for visiting the International Rose Test Garden [here]. Launching this month, Naked Juice has five new veggie-forward cold-pressed juices made with simple ingredients: Bright Greens, Hearty Greens, Lively Carrot, Bold Beet and Cool Pineapple. Naked Cold Pressed Juice is made with ready-to-eat, high quality fruits and vegetables that are cold-pressed right into the bottle with no added sugar, no preservatives and are verified by the Non GMO Project. My personal favorites are the zesty Cool Pineapple and the smooth Lively Carrot. That being said, all of the juices make for the perfect fuel before a morning on the trails.